← Princeton’s New And Coolest Coffeehouse? The Rojo’s Taste Test. Last Call For Crosswalk Meeting: Wednesday 2p.m. At Witherspoon Hall. Last week we reported about Rachael Winfree, a Princeton mother who is trying to persuade Princeton municipal officials to enhance pedestrian safety measures at crosswalks over Chambers Street. Chambers Street is used as a rat-run by crosstown drivers, who use it to cut through town between Route 206 and Route 1. These drivers are frequently distracted and in a hurry. Yet Rachael Winfree’s kids are expected to walk to school at Community Park across this road. We agree that Princeton ought to prioritize the safety of kids walking to school. A Stop sign should be fitted at this junction, which is also dangerous for drivers turning onto Chambers Street from Hulfish Street. We now know that Traffic and Transportation Committee will be discussing this issue at 2 p.m. in the Princeton Municipal Offices at Witherspoon Hall (400 Witherspoon St) tomorrow- Wednesday September 18, Meeting Room B (upstairs). The crosswalk issue will be first on the agenda! We hope that some of our readers who are able will join us to petition our municipal officials to take Complete Streets seriously and put in place the most effective safety measures possible. You can read more about ways you can help at our original report here. 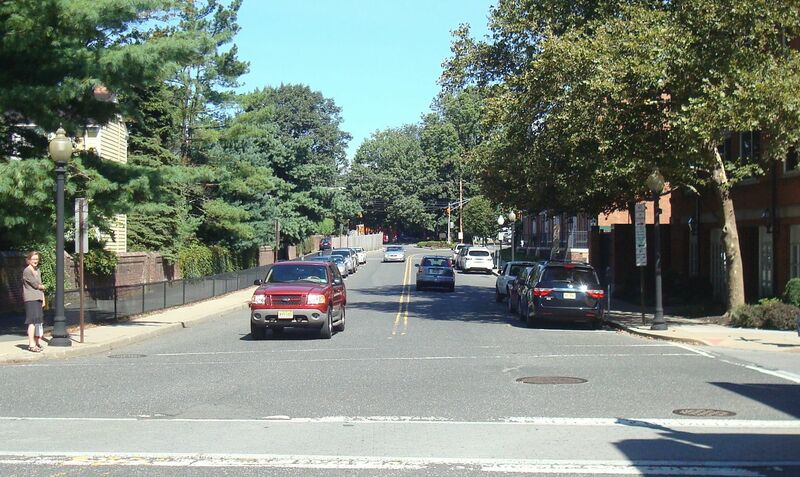 This entry was posted in Complete Streets, People, Princeton, Traffic, Walking and tagged Complete streets, Princeton. Bookmark the permalink. 1 Response to Last Call For Crosswalk Meeting: Wednesday 2p.m. At Witherspoon Hall.